These are some posts that came up on the Derby forum. We touched on initial DA45 setups and pivot pins, but it was buried in a thread where you would not likely find it, so I am giving this discussion a new home and title. Enjoy! In general, going to a DA45 is better with it set up a bit firmer to start. And don't forget the pivot pin adjustment. Whether you take a day, a week, or a couple of months before you start loosening the action, STARTING too loose may cause quite a headache. When I went to blue cushions from yellow, I DID NOT LIKE IT. And I love my DA45's and had been skating them for months. Now I have my blues tightened down with 3 threads showing and the pivot pins set right, and all is good. I may back it off to 2 threads showing in a week or so. This is probably a really stupid question, but...how do you adjust the pivot pin? Stupid question? Sounds RIGHT up my alley. Flip your skate over and look at either the front or back end. Actually, do the back so as to avoid any obstruction from the toe stop. Pivot pin and lock nut: The pivot pin has the ball on one end, the small hex nut adjuster a bit above and is threaded and inserts through the lock nut and is threaded into the truck a good ways. How does a lock nut work: (just in case ) A lock nut is used on your pivot pin, and on the king pin of your skate. It's purpose is to prevent the pivot pin or king pin from moving. It does by creating tension. Lets say you adjust your pivot pin to the correct length, but do not tighten the lock nut. It is possible that forces acting on the pivot pin might get it to turn, either lengthening or shortening the pin, putting it out of adjustment. Now adjust your pivot pin and tighten down the lock nut a bit. This will create a tension in the threads. For the pivot pin to turn and get out of adjustment, it would have to overcome this tension. The forces the pins gets from the cup will not be able to overcome the tension the lock nut provides to the pin. The pin stays where you put it. The tools: I use a 1/2 and 3/8 inch wrench that came with a cheapo toolset I got a WalMart. It is nice because they are not as thick as my Craftsman small wrenches. Now if you are talking mm, the bigger wrench is 13mm and the smaller is 10mm. King Pin Nut: If you are tuning, figure how tight or loose you want your cushions and adjust the king pin nut for the truck you are working on. You will of course want to same setting on all king pin nuts, unless you are getting creative. Back to the Pivot Pin: So your king pin nut is set and your pivot pin is short. Slip a wheel back on the axle and do this: Hold the skate between your legs, hook a couple of fingers in your wheels and pull the wheels back toward the plate. (this assumes the skate is wedged between your legs with the wheels away) It should pull in a bit. Keep lengthening the pivot pin, turn counter clockwise, until that little give stops. That should give you a properly adjusted pivot pin. 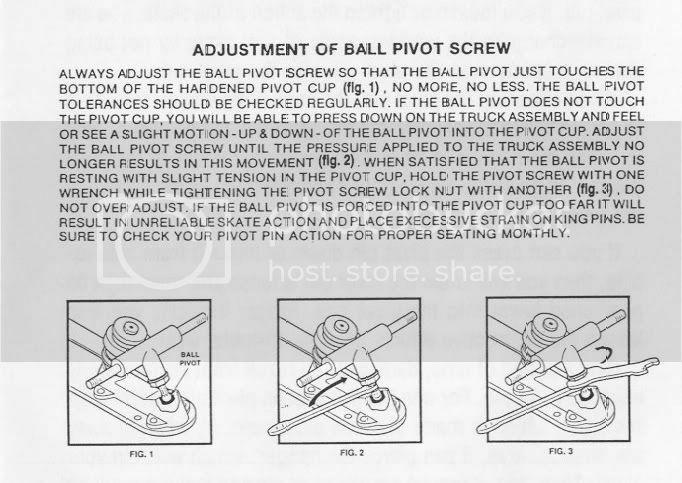 Update: See info about Pivot Pin Neutral Point near bottom of THIS post. Probably a better starting point for pivot pin tuning! Once set, tighten the lock nut making sure the pivot pins' little hex adjuster does not move when you do. And you are done! Repeat 3 more times. A note on lubing the pins. My pivot pins were kind of sticky. I used some 3 in 1 oil to make the adjusting smoother. Definitely make adjusting more convenient. Thanks. Yeah, that is a bit of a problem. The first few times I adjusted, there were no wheels on whatsoever. I pulled down on the axles, which was a reach even for my large hands. Now with my pins oiled, I can get away with adjusting with both wheels on and I get better leverage with my fingers pulling the wheels. If you are of slight build or otherwise don't have much hand strength you could always put the skates on the floor or a table and apply pressure by leaning on top or pulling down while watching for movement of the pivot pin. Me too. After doing the shade tree mechanic thing in my 20's, I get intimidated taking stuff apart in my (almost) 50's. I really cut my teeth when I ordered my Invader. I already had my Magnum, which I was pretty terrified to mess with, but my Invader came completely in pieces. I put that together, getting some help from Doc, and that plate is doing fine. Only after doing that did I have the confidence in taking my Magnum trucks off and replacing cushions and putting it together right. It's not really tough. Pretty easy, actually. But, when you haven't done it, you haven't done it. A little experience is very empowering. Remember, you are now in NEW TERRITORY. All of your old tricks to coax turning out of a probe will not be needed any time soon. Maybe not at all. Remember, DA45's are turney right out of the box. A DA45 with PURPLE cushions cranked down with 3 threads showing will far out turn a 5-10 degree plate. Another thing to remember is that you cannot adjust your kingpin nut with gleeful abandon anymore. Anytime you tighten or loosen the action, you need to check your pivot pin, and adjust it also. I started out on purples, skated that several months, then went to yellows. That was a pretty straightforward change. But when I went from yellows to all blues, wow, that was like a whole new world. I could feel the front of each skate arch SO MUCH that it wanted to pitch me forward if I was not careful. it's not so much of them turning when I go straight... but more when I push with them my foot isn't staying flat (which wasn't a problem with the Probes as they didn't really react). so when I push and my foot angles in, the skate tries to turn left and forward motion doesn't happen. I'm pretty sure it has to do with my feet not being trained to stay flat and I'll just have to work on it, but I do want to try adjusting front and back tightness. The tilt of the foot is to be expected, and is a good thing. In spirited cornering, there will be less side load on the outside of the foot. Your ankle will stay straighter, and the pressure will go down through your foot. (this does not bode well for hockey stops. The DA45 will grip better making that maneuver harder. Gotta be some price to pay for better turning.) You will get used to the push in a while, but don't try getting too loose too soon. Once you get used to them, you will be doing able to do crossovers that will put puzzled looks on the faces of folks with "normal" skate. Generally speaking, I would say start with the action cranked down a bit. Again, the DA45 has so much turning ability by nature, it takes a while to adjust. More can be had WHEN YOU ARE READY. Keeping the action a bit tighter to start will not prevent them from turning, but it WILL prevent them from turning too much until you start getting acclimated. Depending on how you personally adapt, starting too loose might be more of a downer than a help. 2 or 3 threads showing over the top of the king pin nut, and pivot pins adjusted accordingly. Pivot pin BOO-BOOS. There are a few things to watch out for with the pivot pins. They can be set 3 ways, and only one of them is right. Too short: This will provide a somewhat mushy feel, and reduced traction when skating. A hard push to the side will produce some wheel studder. Too Long: This will produce a hyper-active feel in the action and poor straight ahead stability. REALLY TURNEY but twitchy just going straight. Set Correctly: Best indication is good one foot straight ahead stability. Second is good traction. Third is a precise crisp edge to edge performance without the twitchy feel of an over long pivot pin. New and Improved starting point for pivot pin tuning: I was making a mess of my Invaders' pivot pin adjustments. I got back on track and have some new insights. The Pivot Pin Smoking gun. Somewhere along the line of this debacle, I had gotten the bright idea to start my pivot pins cranked all the way down, and then lengthen. I think that the pivot pins were part of the problem throughout most of this unpleasant affair. So, if starting with a very short pivot pin is not so hot, as this experience seems to suggest, where to start with pivot pin length??? After painstakingly putting the plate back together, it was time for cushions. I decided to chuck the yellows, and go back to blues, which were/are working great on my Rebel/Magnum. I put the 4 barrels on and had a thought. How long should the pivot pin be, to rest in its' cup, and have the truck sit optimally over just the barrel cushion? I tightened a pivot pin down, and then lengthened 2 full turns. I put the truck on with the pivot pin in the cup, and it did not quite center the truck directly over the barrel cushion. The pin needed to be a bit longer. 1/2 turn did it. 2.5 turns long from tight should provide you with your pivot pins' neutral position. (The dvw Edit: The 2.5 turns lengthening that set MY pivot pin correctly will likely not be the same for you. The POINT of PPNP (Pivot Pin Neutral Point) is to get the hole of the truck to evenly surround the king pin. Do not obsess over the 2.5 turns from fully short, like dvw keeps doing. Some will be more than 2.5, others less.) So, if you were to put the conical on, tighten the king pin nut just enough to keep things from jiggling, you would be very close to the correct pivot pin length right out of the box. I set all of the pivot pins this way. I checked each truck with their respective king pin/cushion, and all were the same. My pivot pin neutral point worked on all 4 hangers. I then put on the conicals and prepped the king pin nut. Prepping means getting the top of the nylock nut flush with the top of the king pin. After this is done, I then count the revolutions I crank the nut down, and do the same for each king pin nut. (2.5 turns in this case) After cranking all kpNuts down 2.5, to my GREAT delight, every truck seemed to be at the exact same tension. No truck stood out as being loose or tight. The way I set my pivot pin nut is to have the flat part of the nut to face directly in line with the plate/truck. This way, when I adjust the pivot pin, I can make a uniform adjustment. In whatever direction I am adjusting, I just turn the pin till the next flat of the nut is in line with the plate. I did figure that having started the pivot pin length at neutral, that it would be a little long at this point. So for each pivot pin, I shortened 1 sixth, and then another sixth. I did not notice any play in the pivot pin, so at this point it might be just a bit long, or just right. But one thing I am very confident of is that it is very close to being right due to where it started, AND each pin is set exactly the same. On putting the BontInvaders on and trying the action, it felt VERY Magnum like. My Magnum is also set up exactly like this. KPNut tightened 2.5 turns, pivot pins set correctly. I won't skate this until Wednesday, but I am very confident that the Invader Rubiks' Cube is no more. I am going to insert a quote of this over in my pivot pin tuning thread. Having a good starting point of the neutral point, 2-2.5 turns loose from tight, and knowing that each pin is set the same is better than just saying start short and lengthen. This will be a little different for a Snyder, but the principle is the same. Figure out what pivot pin adjustment is neutral, and use that as your starting point. Last edited by rufusprime99; January 17th, 2014 at 10:04 AM. Man, I've come a loooong way from thinking a skate was just a skate. The possibilities are endless! I've been having a look over my new plates and everything seems to be ok...I bought them from Geno and they came all put together for me(with a lovley new toestop too!). Once they're mounted I'll give them a spin and see how they feel under my feet. I'm very excited! In other news, by the definition my pivots must be spot on, however when I first tried the DA45s it felt that they were wrong and it took a couple of weeks for me to adjust to them - had I started changing settings I may have been chasing my own tail for quite a while! This is Snyder info... Some of it does not directly apply to DA45s like the metal to metal wear. 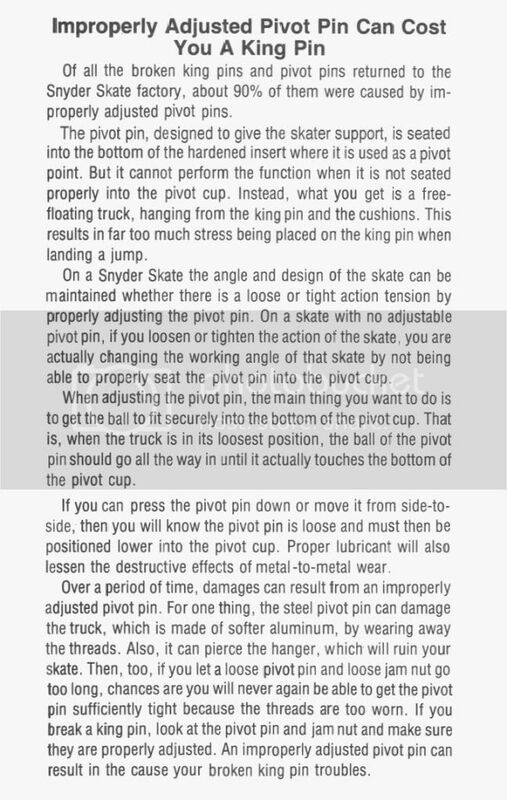 So Doc, based on the Snyder instructions above, it's then the weight of the skater and the skater's manuvers that provide the correct real-time pin/cup fulcrum pressure, resulting in the instantanious truck response - correct? So Doc, based on the Snyder instructions above, it's then the weight of the skater and the skater's maneuvers that provide the correct real-time pin/cup fulcrum pressure, resulting in the instantaneous truck response - correct? Hmmm, I never really gave that any thought... I was just interested in not breaking king pins (none so far) or having the pivot pin come out of the cup. (yeah once or twice.. No fun at all, I'll tell ya..
To be honest I think you are reading way too much into it..
Great info! I'm going to tighten our (my/wifes) Invaders a tad more. This makes me feel a bit more at ease on adjusting the p-pins. Yeah, thats why I recommend not start too loose. It is a pretty good change from a non-turney plate and peoples adjustment times vary. I stayed on my purple cushions a good long while. When I went to yellows, it was all familiar, just more. i adjusted the pin so that it is in there ok but couldn't push the cup itself in any. does that need to be fixed? Good question for Doc. I know that one of my pivot pins (don't remember which) sets differently than the other 3. I never thought to look at how the cup is seated. (I have also been skating it that way for a year now. ) I may tear it down and check that out. Yeah, my left rear pivot pin is short. (no gap between the pin nut head and the lock nut) Maybe that pin cup is higher. It looks the same as the others, on casual inspection. The OTHER thing might be that maybe there is variance in the king pin length. Maybe, on my skate, the left rear king pin is a bit shorter. So then, setting it with two threads showing, like the others, the truck is actually sitting lower and closer to the plate, accounting for the difference. (my short left pivot pin) I will measure it when I take it apart. But again, after a year of hard turning and many grins, it is not like I can tell the difference in the skates. That would also mean that my left rear action should be a little tighter than my right rear. I will have to try and check that out. Interesting little can of worms you opened up here genesea. If that above is any help, there's a great video demo on RollerGirl.ca facebook with how to adjust. If the cup was at the bottom of the hole you have nothing to be concerned about unless the pivot pin will not get short enough.. It looks fine in the pic.. Note IF it is not seated all the way it could go deeper and that would cause your pivot to be un adjusted. Something I'd like to add as well, since I'm OCD about keeping my XK-4's and my Derby Girl's Invader 45's tuned. The pivot pin adjustment is not a 'set it and forget it' feature. You will find that your pivot pins will need to be checked regularly to make sure there is no slop between the pivot ball and the Delrin pivot cup. I do this simply by applying light pressure to the center of my truck, pushing down in the direction of the pivot pin, and watch the pivot head to see if it pushes into/raises out of the cup. If I can apply pressure to the truck and there is negligible movement the pin is properly adjusted. If not I adjust it, remembering to set the locknut. Check your pivot pin locknuts before every skate session. It takes ten seconds and is just as simple as grabbing the locknut and trying to turn it with your thumb/finger. ~ Check the jam nuts at the base of your kingpin. Again, it's as simple as just getting a thumb/finger in there and trying to give them a twist. I wipe my skates/plates down before every session. The process of cleaning things allows you to find and fix small problems before they become Big Problems. It takes a few minutes, but I have the peace of mind knowing my hardware is in good shape when I roll out on the floor. Thanks for all this info! I will be needing to use it in the near future and I am excited! After painstakingly putting the plate back together, it was time for cushions. I decided to chuck the yellows, and go back to blues, which were/are working great on my Rebel/Magnum. I put the 4 barrels on and had a thought. How long should the pivot pin be, to rest in its' cup, and have the truck sit optimally over just the barrel cushion? I tightened a pivot pin down, and then lengthened 2 full turns. I put the truck on with the pivot pin in the cup, and it did not quite center the truck directly over the barrel cushion. The pin needed to be a bit longer. 1/2 turn did it. 2.5 turns long from tight should provide you with your pivot pins' neutral position. So, if you were to put the conical on, tighten the king pin nut just enough to keep things from jiggling, you would be very close to the correct pivot pin length right out of the box. I set all of the pivot pins this way. I checked each truck with their respective king pin/cushion, and all were the same. My pivot pin neutral point worked on all 4 hangers. I then put on the conicals and prepped the king pin nut. Prepping means getting the top of the nylock nut flush with the top of the king pin. After this is done, I then count the revolutions I crank the nut down, and do the same for each king pin nut. (2.5 turns in this case) After cranking all kpNuts down 2.5, to my GREAT delight, every truck seemed to be at the exact same tension. No truck stood out as being loose or tight. The way I set my pivot pin nut is to have the flat part of the nut to face directly in line with the plate/truck. This way, when I adjust the pivot pin, I can make a uniform adjustment. In whatever direction I am adjusting, I just turn the pin till the next flat of the nut is in line with the plate. I did figure that having started the pivot pin length at neutral, that it would be a little long at this point. So for each pivot pin, I shortened 1 sixth, and then another sixth. I did not notice any play in the pivot pin, so at this point it might be just a bit long, or just right. But one thing I am very confident of is that it is very close to being right due to where it started, AND each pin is set exactly the same. On putting the BontInvaders on and trying the action, it felt VERY Magnum like. My Magnum is also set up exactly like this. KPNut tightened 2.5 turns, pivot pins set correctly. I won't skate this until Wednesday, but I am very confident that the Invader Rubiks' Cube is no more. I am going to insert a quote of this over in my pivot pin tuning thread. Having a good starting point of the neutral point, 2-2.5 turns loose from tight, and knowing that each pin is set the same is better than just saying start short and lengthen. Last edited by rufusprime99; May 18th, 2011 at 12:14 AM.